Sushi has been a favorite American meal since the 1980s, and of course, it’s been a Japanese staple for many centuries. And now there’s a new twist on classic sushi. A Japanese toy company has created a sushi Ferris wheel for all your party endeavors. With articles about all things sushi, from what to order at restaurants to sushi s’mores to sushi donuts, we’re obsessed. So the next time you need to have a fun twist to your sushi dinner party, we hope you try this trick. Truly, the toy isn’t anything that will make your dining experience any easier. It’s just a fun little party trick that will make whatever sushi you’re serving that much more enjoyable. Spinning sushi wheel? Count us in! After all, who doesn’t love fun little tricks? Takara Tomy has been at the forefront of many fun sushi toys. 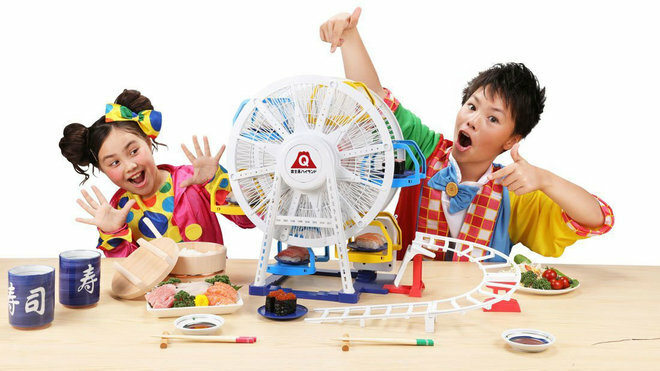 They created a sushi train set to bring home the sushi, and now their sushi Ferris wheel is coming this July. Called the “Sky Party Sushi Big Ferris Wheel,” it is a battery-operated toy that is perfect for your at-home parties. According to Food and Wine, it is small enough to sit on top one of your tables. But it’s tall enough for your guests to wonder what in the world they’d gotten themselves into. The inspiration for the toy is quite the story. Takara Tomy’s inspiration came from a popular source. It’s modeled after a ride found at the Fuji-Q Highland, the largest amusement park in Japan. But to most us, it’s just a fun idea. Sushi coming around to you on a wheel? Who wouldn’t love that? In this quick video, you can see just how amazing the Ferris wheel actually is. So get ready to spice up that dinner party you’re having this summer. Between the new “Sky Party Sushi Big Ferris Wheel,” or their train set product, your friends will love coming over to your home. You can own this lovely toy for 9,980 yen (or $90).